Do you have the makings of a great detective? Check out our Paris Room Escape! 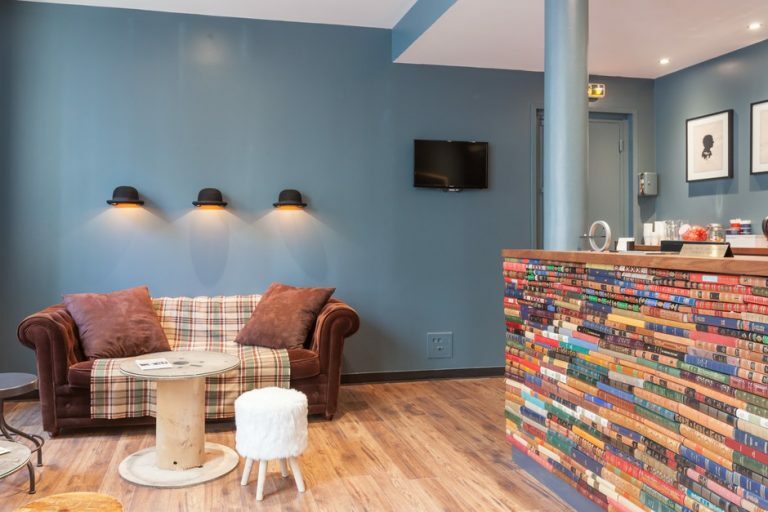 Lock Academy, mysterious detective school located rue Coquillère and boulevard de Sébastopol in the heart of Paris, welcomes new students! After having travelled the world and solved all sorts of investigations, Professor Lock decided to settle his magnifying glass and hat in Paris. He has opened his own detective school to pass on his knowledge to his new recruits. True to his style, the Lock Academy resembles a real-life Cluedo where each nook and cranny hides mysterious curiosities. That’s why each room at the Academy houses a Live Escape Game. In teams of 3 to 6 players, we invite you to explore the school and discover every secret and surprise hidden within our walls. From the office of our Dean to the school Museum, to Cher’s student bedroom, with stops at Professor’s Lock private apartments, the mysterious Exam room or even the highly secret and secure archive room, you will investigate in all the most famous Escape Room Paris of the Academy. Recently murdered Dean Doyle, mentor and best friend of Professor Lock, had a large office just off the academy’s reception. Being a Paris lover, he loved the fact that his office has windows with a view on the Louvre Post Office. Do not trust the old-fashioned ‘So British’ decoration of his office, and the seemingly old trinkets it is filled with… things may not be as old as they appear. The perfect decoration for an Escape Room Paris! 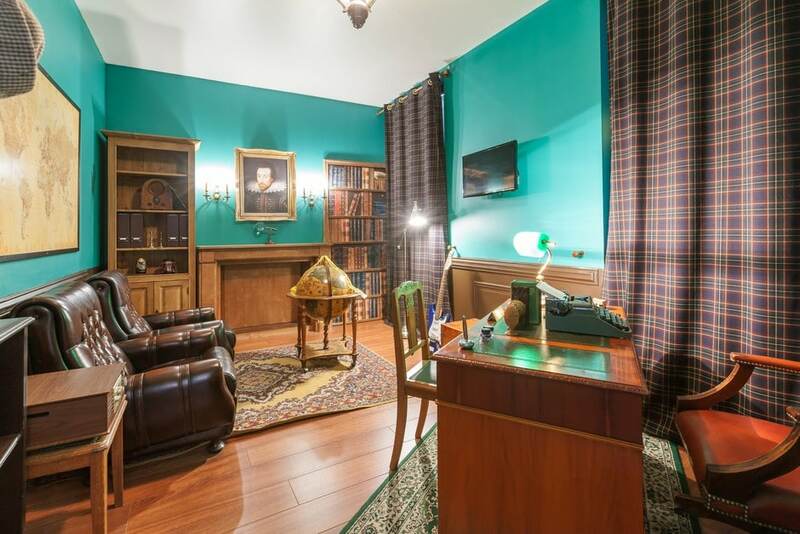 With its bookshelves, comfortable armchair and of course the large desk, this room hides a mystery for apprentice detectives of all levels. Built as a real-life Cluedo, this Live Escape Room requires you to hunt for clues and to use your brain. More information about our mystery A Near-perfect Crime. Cher, only daughter of Professor Lock holds a bedroom in the basement of the school. 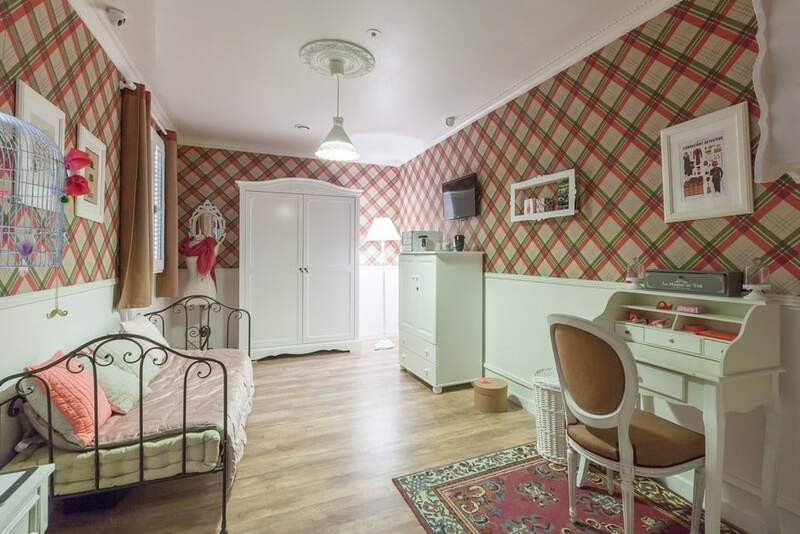 As a student at the Lock Academy, Cher’s bedroom is similar to that of any student. A large chest of drawers, a desk, a bed, a TV, all in a cosy and elegant atmosphere. Just like Cher herself, her room is very rigorously organized: impeccable, tidy and decorated with care! But appearances may be deceiving, this Escape Room seems to be hiding a dark secret. Her room has been empty since she disappeared, but you can still smell her perfume! With no news from her in the past 48 hours, Cher must be in danger. In order to find out what happened to her, you’ll have to dive into the case quickly. For this Live Escape Room go try and find her deepest darkest secrets, unveiling her hidden romances and her personal investigations. More information about our mystery Little Miss Lock. Lock Academy’s brand new Museum opens its doors for you! 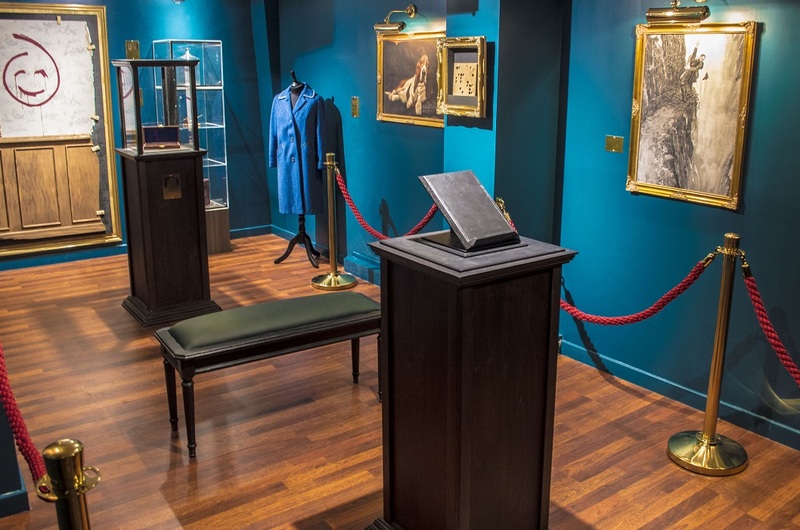 Including pieces such as Sherlock Holmes violin, and Miss Marple’s cardigan; our tastefully decorated museum features emblematic belongings from many of history’s greatest detectives, all alumnis of the prestigious Lock Academy detective school. During your visit you might have the chance to take a glance at the magnificent Detectives’ Guide, the museums crowning jewel, what a privilege! Your visit will start in the Exhibition Hall of the Museum, where many surprising pieces are waiting for you. Hanging on the wall are displayed paintings of the greatest detectives and unique objects in the displays. 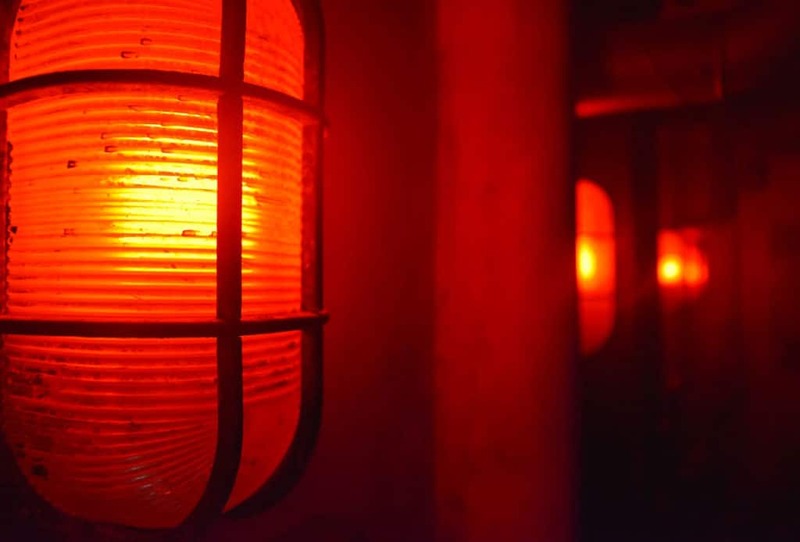 We suggest you to take a listen at our entertaining audio-guides, to learn all about the history of our Live Escape Game detective school and its famous alumni! No doubt that this cultural gem will overshadow even the greatest Paris museums! The archive room is one of the most secret room of the Lock Academy detective school. Designed as a highly secure room, only a few selected VIP have ever been able to see the mysterious objects and files hidden in the archive room. Recently renovated, the archive room has dumped dusty paper files to become beautifully high-tech. The rumour has it that one of the treasures of the archive room are rare childhood pictures of Professor Lock and Dean Doyle before they both became bold. All of the most intense study sessions and best Friday nights start in the students’ common room, it is also where you will begin your thrilling investigation on the quest to find the archive room. 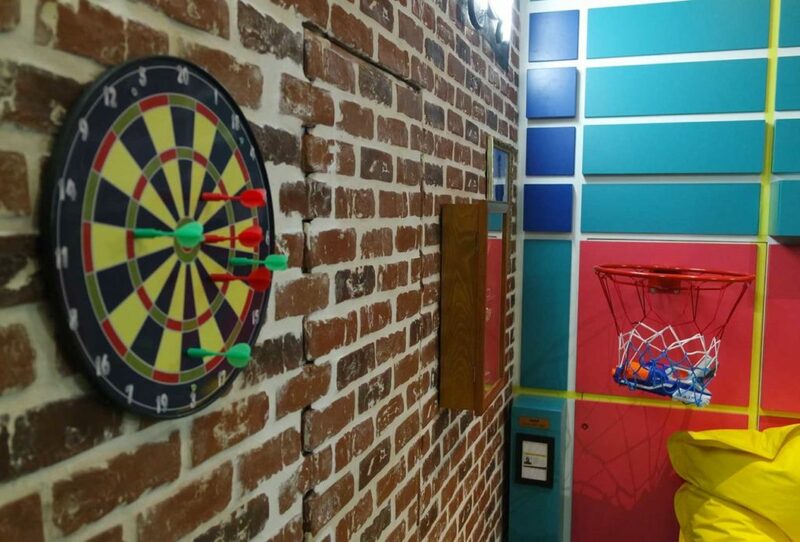 With its comfy chairs, board and arcade games and basketball hoop, you might have so much fun hanging out in the colourful common room that you’d forget about your main mission in our Live Escape Room Paris! Professor Lock, distinguished world class detective and founder of the Lock Academy, occupies an apartment near the reception of the school. Being a 70s child he decorated his interior accordingly. 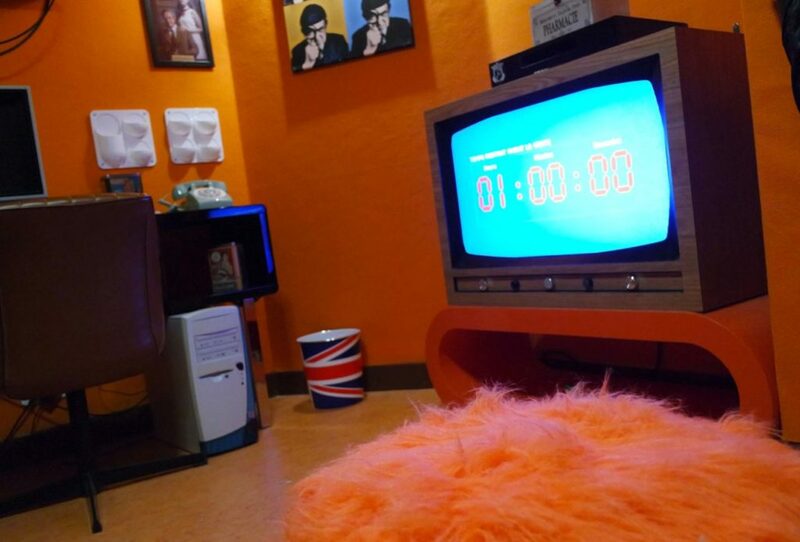 Immerse yourself in the charming retro look of the psychedelic patterned wallpaper, bright orange fluffy carpet, vintage television… Professor’s Lock carefully decorated apartment has a lovely kitsch atmosphere with strong 70s UK vibes, the ideal environment to carry on your investigation at our Escape Room Paris ! Do not trust the old-school look of the room, it hides many clever mechanisms… Maybe they will help you understand why Pr Lock has gone mad and decided to sell the Lock Academy to his sworn enemy ? There is no time to waste, try unveiling all the secrets of Professor Lock and come solve the mysteries of our Live Escape Game Paris! Come confront your mind to E.V.A., the ruthless Artificial Intelligence system freshly developed at the Lock Academy. In the mythical examination room of our detective school, E.V.A. will test your skills as a good detective and decide if you are worthy of receiving the prestigious diploma of the Lock Academy. Generations of apprentice detective, such as Sherlock Holmes, Miss Marple or even Scooby-Doo have taken this test in our Escape Room Paris full of tricks and surprising mechanisms. The examination room hides many references to all the investigations that have made the Lock Academy famous: Cher Lock’s bedroom, Dean Doyle’s office, the student’s common room… and many more exciting atmospheres ! Try to make your way through the challenging tests E.V.A. has prepared for you and dive into the Examination a Live Escape Game Paris that is full of adrenaline!